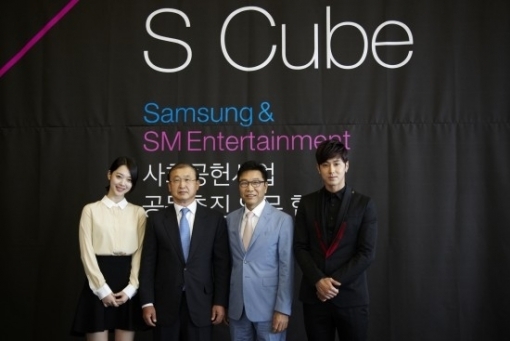 On this day, SM signed a contract with Samsung to work on a social contribution project together. SM and Samsung’s project has been named S3 (S cubed; Samsung x SM x Society) and hopes to create a better future and society through SM and Samsung’s work together. As a combination of SM’s culture contents and Samsung’s social contribution platform, the project is expected to bring forth a new model for social contribution work by corporations. Through the joint project, SM will be taught Samsung’s know-how of various social contribution activities, which include supporting study rooms and interracial families, and participating in charity work, in order to create a solid foundation for the future of their social contribution work. SM will build special study rooms that bring in SM singers, composers, and producers to teach music and dance to children in low-income families while Samsung will provide the children with various educational programs and manpower. The project will be connected to SM’s concerts that are held all across Asia and will support interracial families as well. Samsung will visit the female immigrants’ countries of origin and lend their support, while SM will hire them as interpreters and invite their families to watch the concert, creating a new kind of social contribution project that can also be applied overseas. SM will create their volunteer group this year and will work with Samsung on sustaining their future volunteer project.